Gojo designed this automatic hand sanitizer dispenser so there's no need to touch a dirty dispenser — ideal for hand hygiene. 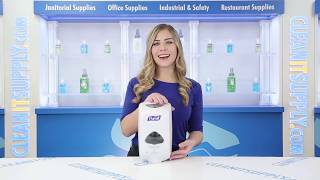 Automatically dispenses the perfect amount of soap needed in a single shot. 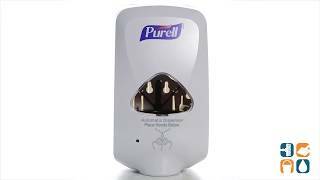 Fully ADA-Compliant, this touch free hand sanitizer dispenser features a skylight with an extra-large sight window that makes it easy to see when it’s time to refill. Designed to hold 1200ml refills GOJ 5665-02, GOJ 5361-02 & GOJ 5362-02 (sold separately). Plastic. Mounts to wall with adhesive (included) or screws (not included). Requires three C alkaline batteries (included). 6.375" W x 4.438" D x 11.25" H.